Building a home theater can be as simple as buying a television set and a stand and calling it a day. There are plenty of people who would do just that because they do not put the right amount of effort and thought into the process. However, if you are building an honest to goodness, real home theater, Columbus, Ohio has plenty of stunning options for you to choose from. If you want to take your home theater up a few notches on the style scale, Amish Originals Furniture Company might be the best resource for functional but still stylish furniture. What Makes a Great Home Theater? Whether you have a large room that will be best served by the full wall unit or a smaller room that will require a corner unit or a smaller TV stand, we have the best choices for you. 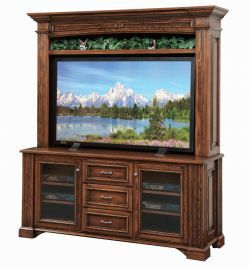 There are several things that you should consider when choosing the Columbus, Ohio furniture for your home theater. First, it has to be big enough and strong enough to hold the television set as well as the other items that you are going to be placing on it. Most people want the unit to have at least a little bit of storage capability as well- especially those who have large collections of movies and accessories. It has to be attractive enough to blend in with the appearance of the rest of the room, and most people do like all of the rooms of their house to have at least some cohesive flow to them. A wall unit, the largest of the choices, will hold the typical television set plus have plenty of shelf space for satellite dish or cable boxes, DVD players, even sound systems and stereos. They do require quite a bit of open space, however, so it is important to measure before buying one. In a smaller room, especially one that does not have a lot of open floor space, a corner unit is perfect because it will hold your television set safely while minimizing the amount of floor space that is sacrificed. Like all other Amish furniture, these television stands are hand made out of real, kiln dried hardwood for durability and attractive appearance.